Bell Ringers have been active in Ellisfield for well over 100 years, providing the classic village soundscape. We are keen to recruit new Members whether you are an experienced ringer or a newcomer to the ancient art and needing to learn from the beginning. Currently we only have one member from Ellisfield (Steve Brown) and to ring all five bells we have to call people in from other parishes. Practice sessions at St Martin’s are most Fridays starting at 7:30pm (and Saturday mornings are also being considered). To find out more, call Peter Willis on 01256 472505 or email him HERE (or have a word with Ellisfield resident Steve Brown on 381420). 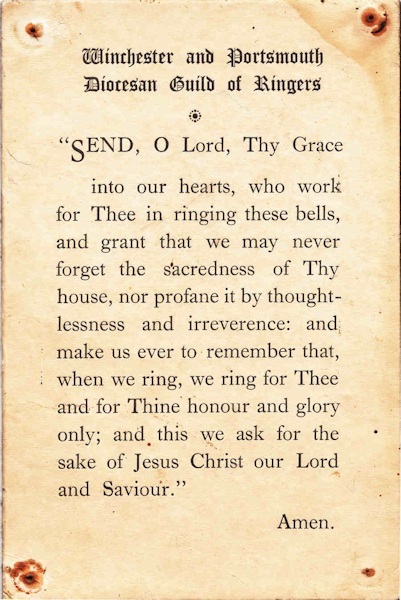 The original bells were cast around 1700 but were stored in a barn for over a hundred years until 1887. The belfry rules from 1888 (see left) are still displayed in the belfry tower. 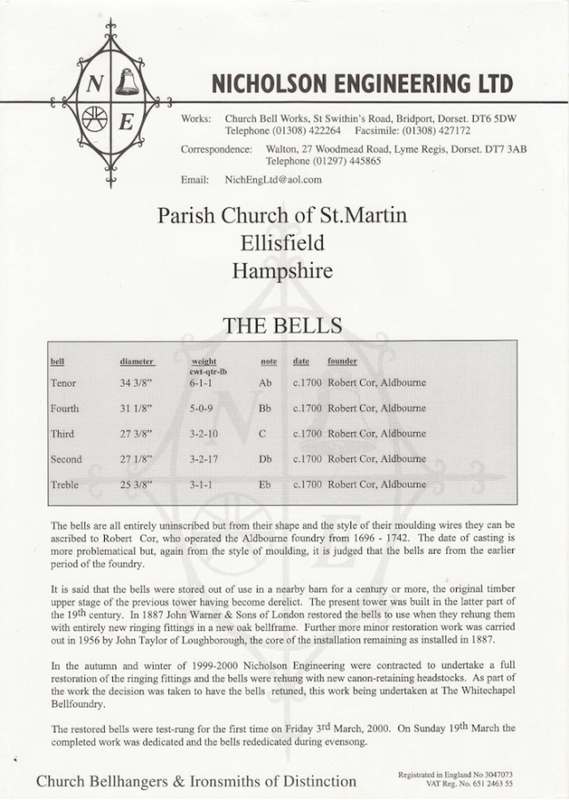 In 2000, the bells were refurbished by Nicholson Engineering Ltd and the document (shown right) includes a brief history and the specifications of the five bells. 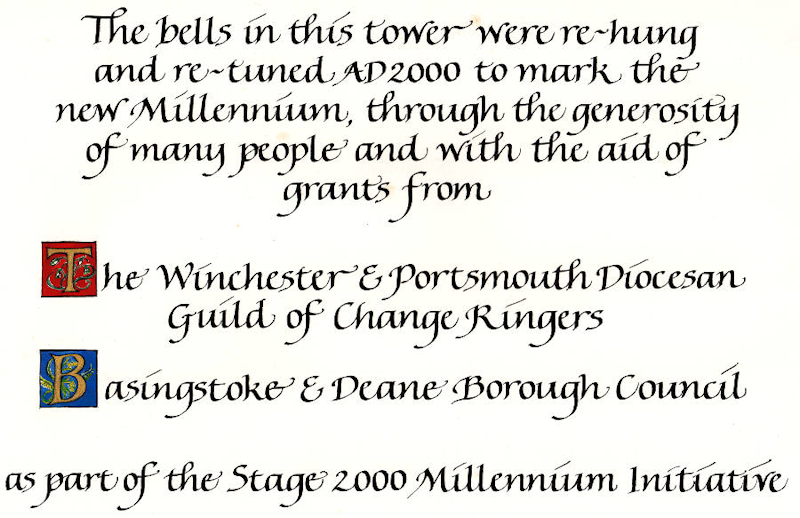 The plaque (shown left) thanks the many people that helped and for grants from the Winchester and Portsmouth Diocesan Guild of Change Ringers and Basingstoke Council for the refurbished bells in 2000. 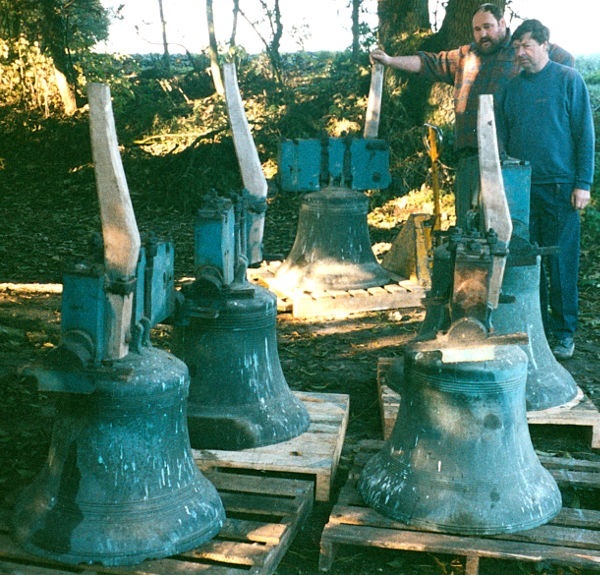 The picture (see right), taken by Jane Evans, shows the bells on the ground outside the church before going for refurbishment. Note the “dispatch markings” left by the pigeons! A Peal is a session of ringing that has over 5000 changes without a mistake. It runs for several hours and you are not allowed any aids to remember the sequence. Ringers are keen to not be interrupted during the peal! 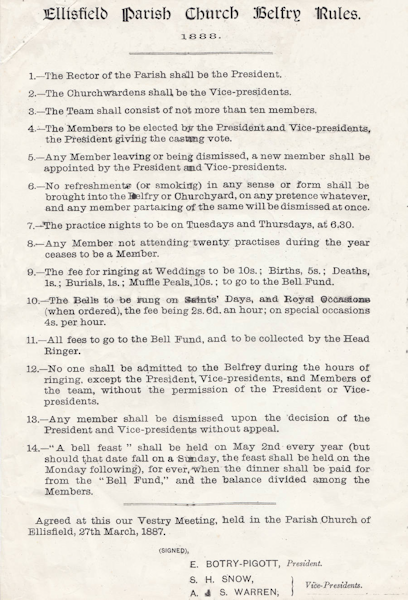 Ellisfield has seven peals from 1964 through to 2011. 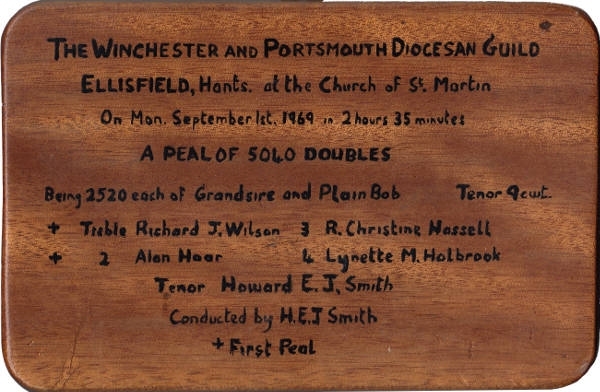 The plaque (shown left) commemorates the 1969 peal and also on the belfry’s wall (see right) is a prayer for the bell ringers! If anyone has more archive material we would love to add it to this site. There are two main places to start, Wikipedia (see the pages on peals and change ringing) and bellringing.org (which will answer all your questions if you are new to ringing and provides links to go further). Despite being an ancient art, it is supported by the latest technology. It has a good representation on the web and there are programs and apps available for your SmartPhone and PC. Apps for iphones, iPads and Android phones are ideal for use in the tower and on the road and PC apps are for the bigger tasks from your desktop.